This 3-D expedition transports travelers on a sweeping, simulated flight over Pandora’s colorful landscape. I've been on most Disney rides, but I have to say, this is probably one of the best I've ever been on! Up there with Rock 'N' Roller coaster and Tower of Terror. First off, the queue is breath taking. The attention to detail shows. Then the ride. My goodness. It feels like you are flying through Pandora! Even the seats breathe to make it feel as if you really are on a banshee! We waited to and a half hours and it was totally worth it! So, my family and I really wanted to check out this attraction and we stood in line for 2 1/2 hours in the downpour of rain..... Let me tell you... SO WORTH IT. It was an absolutely amazing experience. Completely blew our minds. Beautiful and so life-like... it REALLY feels like you're there!! You've GOT to see it for yourself! We loved it so much that we couldn't stop smiling after, and later in the day we stood in line for another hour and a half just to do it again. Absolutely breathtaking. Bravo!! Imagine straddling the back of a wing-flapping banshee, darting and swirling through the canyon updrafts, free as the wind. Below you: the otherworldly planet of Pandora – grand in its vastness, surreal in its bioluminescence. Hold on tight! You can ride this beast. You can sense its banshee breath. That’s because you’re high-flying in an immersive new adventure, Avatar Flight of Passage, set to open May 27 at Disney’s Animal Kingdom. 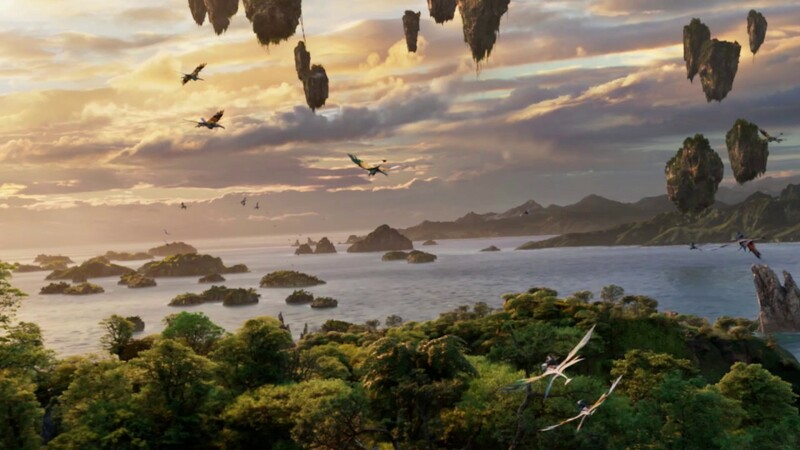 A shining star of the theme park’s all-new land, Pandora – The World of Avatar, this 3-D expedition transports travelers on a sweeping, simulated flight over Pandora’s colorful landscape. Guests soar around floating mountains, plunge through ancient caverns and skim across roaring oceans, culminating in a realistic encounter with the fiercest king of the air, the Great Leonopteryx that boasts a 45-foot wingspan. The journey begins in the queue as guests begin an uphill trek around a massive root structure, over a land bridge above waterfalls to an authentic totem garden. Meandering passageways lead to a cave-like structure where the great–winged banshees, or Ikran as the Na’vis call them, are celebrated in paintings and majestic totems. Next, guests enter an old, once abandoned RDA facility with a laboratory partially restored. Here, there are scientific experiments in progress with references to habitat restoration, the ecosystem, water purification and the connection of all living things. Next stop is the genetic matching room where explorers are scanned and genetic material is sampled to connect them to personal avatars in preparation for a flight experience. Once matched, adventurers board link chairs, don flight visors and prepare for the flight. Next stop: a mystical world like no other. Flying on the back of a banshee represents an important rite of passage for the Na’vi and as visitors to the alien world, guests will have a chance to be tested and guided through the wondrous journey. After entering a state-of-the-art theater, each guest straddles a single-seat simulator (like a motorcycle) that delivers a realistic sensation of riding a living creature. Guests will experience the swift and graceful movements of flight and even feel the banshee breathing beneath them. The multi-sensory experience uses cutting-edge technology and intricate special effects like never before. This heart-pounding adventure transports explorers through the alien world of Pandora, offering lifelike encounters – splashing whale-like creatures, blowing wind, roaring banshees, and a threatening encounter with a flying predator. The exhilarating 4-minute flight through the sci-fi world of bioluminescence and floating mountains is orchestrated to a complex musical score recorded by the London Symphony Orchestra. Avatar Flight of Passage will be a FastPass excursion at Disney’s Animal Kingdom. Only explorers 44 inches or taller can fly on the back of these flying creatures.